It hasn’t been too long ago that LinkedIn morphed from a teeny professional networking site to an enormous world force. Ever since its beginning, B2B marketers have been trying to crack the code for B2B success. With all these millions of professionals in one place, surely there’s some way to open up the floodgates to leads, isn’t there? And, yes, there is a way to open up the floodgates to success. The conventional LinkedIn advice isn’t detailed enough: 1) Join. 2) Be active. 3) Get leads. What?! So, what does one actually do? Sure, you might accidentally catch a few falling leads, but in order to really win you need to do your own prospecting, LinkedIn style. How do you cut through the gaggle of job seekers, and find the qualified people to do business with? In this article, I’m going to show you 7 tips that will help you better leverage LinkedIn to be a powerful B2B marketing tool. LinkedIn does work for B2B leads. Do Twitter, Facebook, Google+, and Pinterest? Maybe, baby, but don’t bank on it. 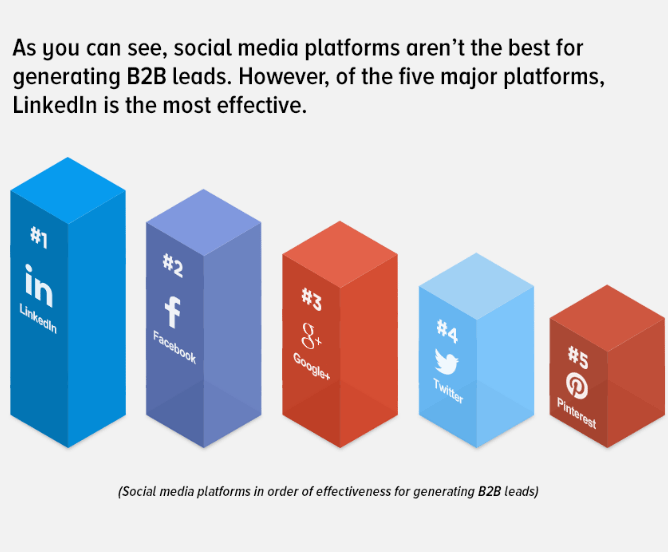 Most B2Bs are using social media to get leads, as the research indicates. But how effective are these social media efforts? Not very, says the data. According to InsideSales, social media is overused when we consider how many leads it actually gains. Before I go all technical and start giving you killer tips, let me step back and do a little cheerleading number. To put that into real numbers, LinkedIn is responsible for more than 80% of a business’s social media leads! All the other social media platforms put together only amount to 19.67% of leads! 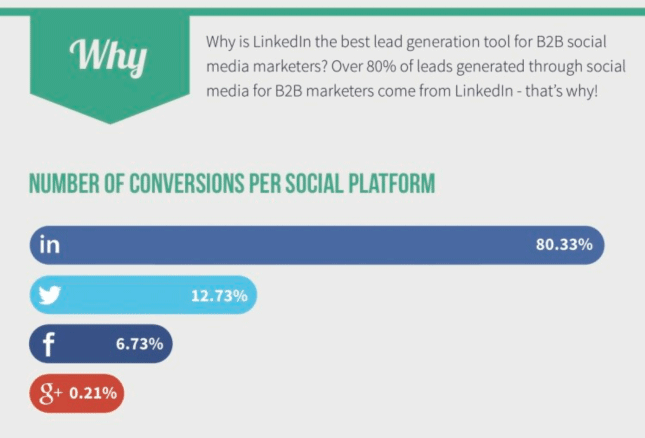 The bottom line is this: LinkedIn works for B2B lead generation. All that remains to be done is to leverage LinkedIn in the best way possible. These 7 tips will help you do just that. 1. Turn your company page into a lead generation page. In order to make leads from LinkedIn, you have to be intentional. Leads don’t just fall into your lap. You work for them. The best way is to turn your business or company page into a lead generation page. This is a course reversal from the typical company page, which shows basic information and facts about the company. Who reads that stuff anyway? Your company page is a pipeline for LinkedIn leads to visit your actual company website. What you can do is structure your company page in such a way that it leads up to a conversion action. The conversion action is a clickthrough to your website, either in the company description or Recent Updates. First, use an image that gets attention or creates interest. The header image is the first way to attract a user’s interest. 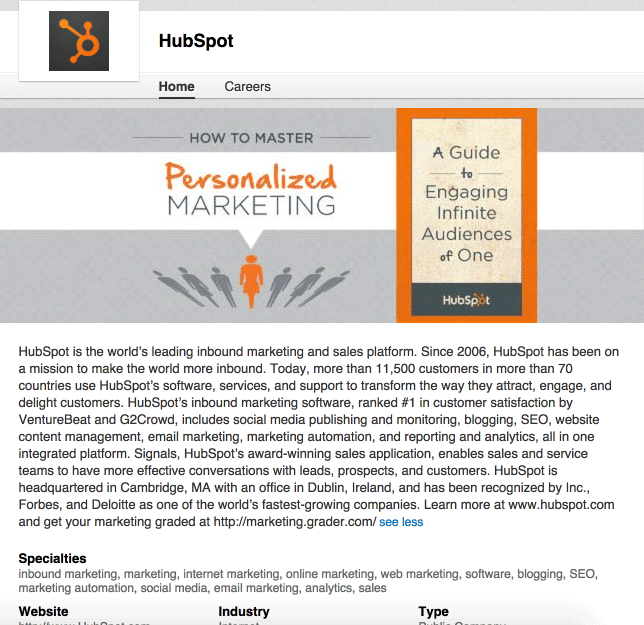 This is what Hubspot does with their header image, in which they advertise one of their many guides. The header image is a clear way of prospecting for those who are interested in learning more about personalized marketing. The header image is only where it starts. You want a response, and the next logical response is to keep reading. The image both grabs attention, and makes the user eager to find a way to get their hands on that guide. Second, create a clear and compelling pitch in your company description. This is where many companies falter. The company description should not be a dry explanation of how much you grew, and how many offices you’ve opened. That’s not the stuff of lead generation. The most important part of your company description is the first two-ish lines, because that’s all that LinkedIn displays. In order to read the rest of the description, the user must click “see more.” You’ve got to grab the user with your first couple of sentences, or they won’t read all that sparkling copy you created. That’s the path of the user who is interested in finding out more about your company — a prospect. It’s up to you to make your company website as conversion-ready as possible. 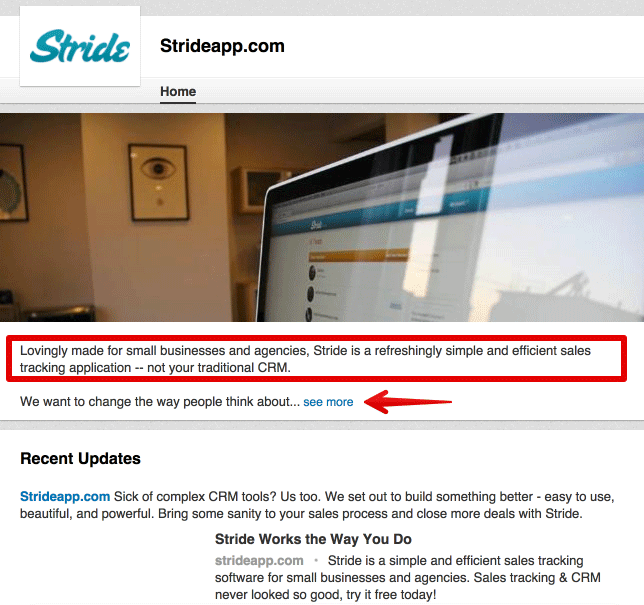 Third, make your Recent Updates section clickable and conversion-focused. Just in case prospects don’t click through your company website on the company information section, you want to get them in the Updates. As long as you’re regularly posting updates, you’ll have an active and engaging feed. The best way to gain leads from this section is to post updates that are directly aimed at your target audience. You can post blog updates, link to your infographics, and share other information, but keep this in mind: You’re looking for clickthroughs from information-seekers. 2. Create a showcase page. LinkedIn created showcase pages for companies to promote individual brands that are extensions of the company. Showcase pages are the perfect way to segment your inbound LinkedIn traffic. If you can create a business unit that is directly connected to a specific target audience, then you are in a position to create a Showcase page. Represent? Relationship? Audience? Sounds a lot like B2B marketing to me. A Showcase page should target one customer segment, and provide information that is relevant to them. Your Showcase page gets a larger header image, more above-the-fold update posts, and places to link back to your company. In this way, it differs from company pages in several key ways. 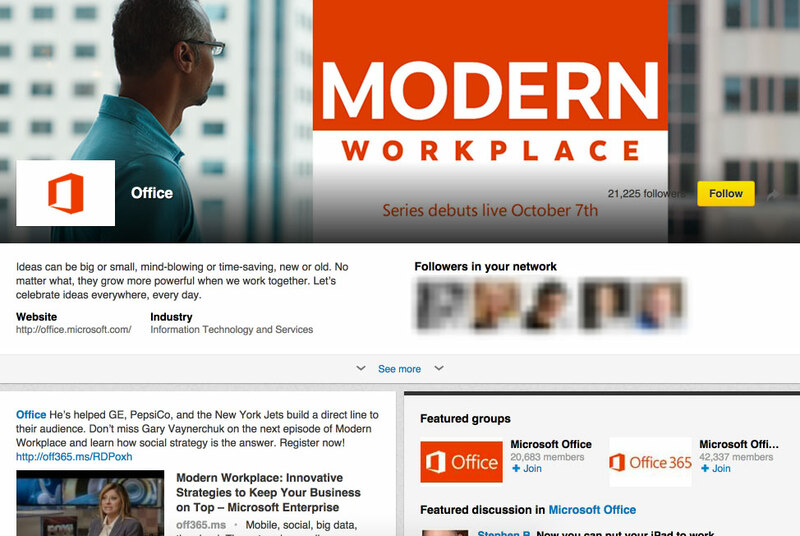 This is what Microsoft’s Showcase page for Office looks like. 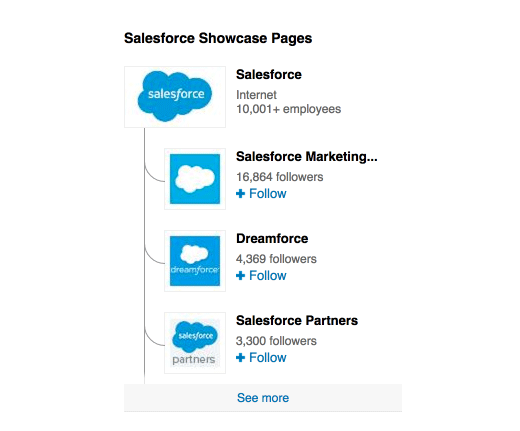 A massive company like Salesforce has several Showcase pages. Here some tips for making your Showcase pages as powerful as possible. Make it conversion-primed, just like your company page. It’s important to keep the name of the page short, so it won’t be truncated in the display sidebar. In the Showcase page name, use a word that your audience will understand and relate to. Showcase pages are simply another way to spread the net a little bit wider and to gain even more targeted leads interested in your product or service. So far, I’ve explained two inbound techniques for gaining leads. Now, I want to explain how to go out and find your prospects. They may not come find you, but you can go find them. 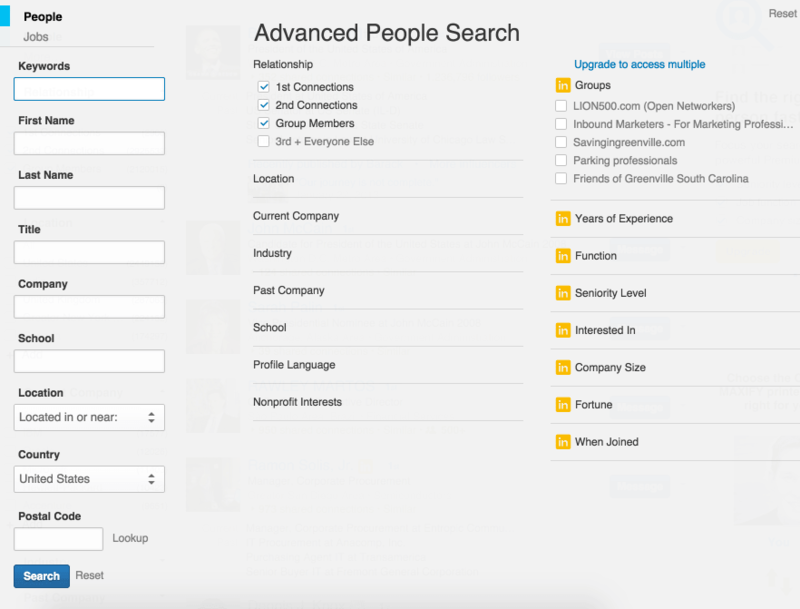 LinkedIn’s advanced search gives you an incredible way of identifying the exact type of people who you are targeting. 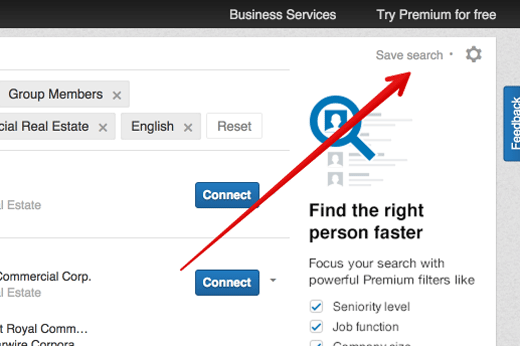 From the LinkedIn header menu, click the search people icon, and the advanced option. 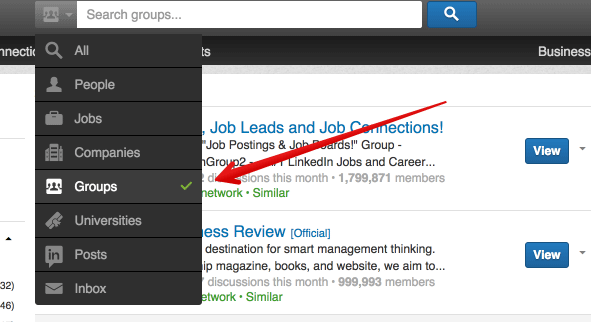 Even without the upgraded LinkedIn membership, you have a great filter for narrowing down your search. The most powerful aspect of Advanced People Search is the center column, in which you can filter your search by location, current company, industry, past company, school, profile language, and nonprofit interests. Advanced search is the single most powerful technique for directly finding targets. Keep in mind that the bigger and better your personal network, the greater your chance of finding warm prospects. 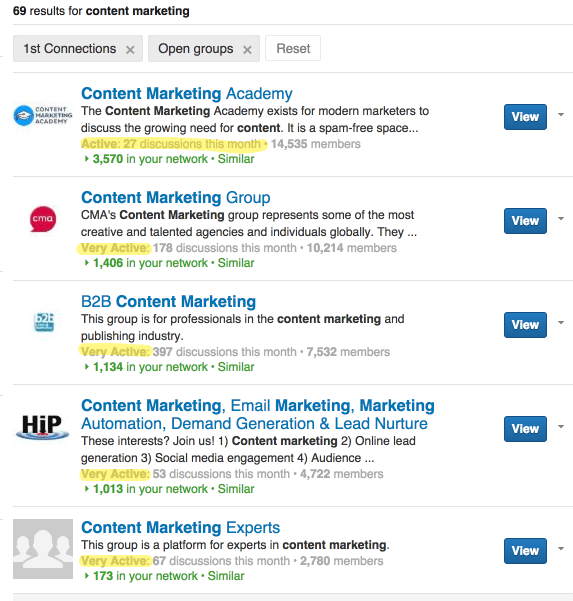 While LinkedIn’s advanced search does allow you to search the network as a whole, the best leads will come from people to whom you are already connected at a first, second, or third level. When you go through the work of creating a highly specific and targeted search, you’ll want to save it. Saved searches create a way to stay active in your prospecting. You know that getting B2B leads isn’t a one and done activity. You have to maintain consistency in order to have a steady pipeline of sales. Directly from your advanced search, look for the “Save search” option in the upper right corner. When you create a saved search, not only do you get to find that exact search again, but you can also set up alerts. Searching for people is a very detailed and granular approach to looking for leads. It’s a great approach, but there’s another one: Groups. At the time of writing this article, I identified 2,058,816 groups on LinkedIn. You can be fairly confident that there’s a group in your niche. A great way to find blocks of leads is to search for groups, join these groups, maintain some level of activity in these groups, and nurture leads in that way. Simply perform a simple group search using relevant keywords. Group searches do not have the same advanced features that people or company searches have, but you can narrow down your search according to relationship level, category, and language. Highly relevant. The group must be a nearly exact match to what you are seeking in a target audience. Medium size. There’s no “ideal size” since that depends on the nature of your business and niche. Keep in mind that you don’t want to get lost in a huge group where no one will notice you. Neither do you want to join a group that has too few people to matter. LinkedIn allows you to be a member of 50 groups, so choose carefully. LinkedIn groups offer a lot of great networking opportunities. One of the ways to get even more from the power of groups is to create your own. As you join groups and interact with groups, you may identify an opportunity for another group to be formed. When you become the owner and moderator of your group, you gain leadership and recognition in the industry. As long as you position yourself authoritatively and not in a salesy way, you can form a place where your target audience can gather and interact. LinkedIn has a powerful content publishing platform. Be aware that publishing has not yet rolled out to all users. If you have publishing access, be sure to use this platform for even more exposure. LinkedIn members who are publishing report that they’ve experienced a lot of success. This is a broad-level strategy that leaves you lots of room to trace down more precise strategies. LinkedIn offers a lot of opportunity, and is the ideal resource for B2B marketing. But without the right knowledge, it becomes just another time-sucking social network. Next time you’re on LinkedIn, spend at least thirty minutes doing some advanced search or group search, and see if you don’t come up with at least five prospects. It’s a start, and it could very well turn into your next B2B sale.